When you are into a port in the morning and out by evening, any port of call will provide only surface impressions. Here are a few of mine based on our three ports of call in the Western Caribbean aboard the Voyager of the Seas. I had heard that Jamaica was a third world country, but that was not the case. Perhaps it is a second world country. It helped that the country, officially independent only since 1962, was part of the British Commonwealth because the Brits helped provide much of the order and infrastructure the island needed. Today, Jamaica feels like a country pulling itself up by its own bootstraps, albeit slowly. Yes, you can find shacks made of tin, but they seem few and far between. What you see far more of are homes under construction, a process that may take many decades for a single house. A family may decide where to build a home, clear the land, pour a foundation and then work on it piecemeal over many years. No contractor is needed, and apparently in many cases no government permission is needed either; you have squatters’ rights. Pick a site, work on it as time and money allow and maybe by the time you are a senior citizen it will be finished and you can move into it. There are no construction crews to pay and no mortgage seems to be necessary, just lots of time, tenacity and determination. It makes driving around Jamaica a surreal experience because so many houses are shells of what they hope to be someday. The country’s populace is overwhelmingly black but many segments are upwardly mobile. Cars are relatively few in relation to the population but the roads we traveled on were first world. Gas is prohibitively expensive for most but it matters little because a car is also beyond the reach of most. Drug trafficking is an acknowledged fact of life on the island and is a significant but undocumented portion of the island’s economy. Marijuana possession and use (except in certain religious ceremonies) is illegal but it is not too hard to acquire. Electricity is controlled by a state monopoly. Many of the lower income residents cannot afford electricity rates, so they steal it instead and hope they will not get caught. We found the climate in January to be delightful: in the high seventies but with comfortable humidity. Our day trip first to Dunn River Falls, took us about an hour’s drive south of Falmouth where our ship was docked to the city of Ocho Rios. Dunn River Falls is a steep but not insurmountable waterfall that you can climb up. A climb consists of a dozen or so visitors led by an experienced river guide, who often climb hand in hand to reduce slipping. Some groups chose a route along one edge of the falls, others ascended by repeatedly traversing across the stream. It was a neat experience with the comfortable water temperatures making it refreshing as well, but is not for the faint of heart. My sense of balance is not great, and my wife is vertically challenged. After she slid a couple of times we felt it best to exit about a third of the way up. For those with the agility (and even those without) it is great and somewhat scary fun. Upon entering and exiting the falls, numerous vendors will try to engage you in friendly conversation. Deals can be made, so if so inclined dicker away and you will likely get a better price. There is also a food court full of Jamaican food, including their popular jerk chicken. To save our sensitive western stomachs, we were advised to drink bottled water only. We also took in the Green Grotto Caves, a limestone cavern half way between our Freeport and Dunn River Falls. The tour is relatively short (about 45 minutes) and does not go that far underground, but is probably worth the $20 entrance fee, if for no other reason than to see so many bat colonies up close. The bats looked more cute than scary. Jamaicans really appreciate visitors, or at least their money. There was a small but enthusiastic party yelling, dancing, jumping and waving goodbye to our cruise ship when we pulled out of port. We caught the spirit and waved back from our Deck 7 balcony. I’d like to say that I spent a full day seeing sites in Grand Cayman Island, a couple hundred miles to the west of Jamaica, but luck was not with us. Our crossing of the Western Caribbean was bumpy, to say the least, due to the arrival of a powerful cold front. The front made large waves, brought brisk winds and a night of interrupted sleep as irregular rouge waves seemed to punch you in the kidney as you slept. Considering the size of our ship, this was quite an accomplishment of nature. The winds had not passed by morning. This made the ship’s usual anchorage near George Town chancy. 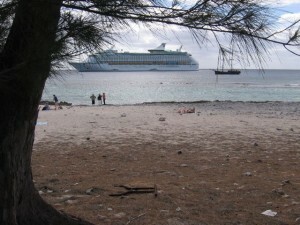 Instead our captain parked the Voyager of the Seas on the calmer leeward side of the island. The high waves and cold air also canceled our planned scuba diving over a coral reef. Unfortunately, when we tried to book alternate tours they were all filled up. We did take the tender over to Grand Cayman Island, but there was little to do but look around the immediate vicinity while our tour options eventually dwindled to zero. Some vendors set up shop near the tender point, which allowed us to do a little shopping, but by noon we were heading back on the tender to our cruise ship. The island certainly was photogenic and also more prosperous looking than Jamaica. Both islands are part of the British Commonwealth, which you can infer by the cars driving on the left side of the road. Unlike Jamaica, Grand Cayman Island is so flat and close to sea level that I fear that with climate change it will be one of the first islands to disappear into the sea. In short, I would not be investing in any property on the island. The water is a beautiful aquamarine color but the beaches were too turbulent to wade into. Luck of the Irish for us with this port of call. Cozumel is an island that sits off the eastern edge of Mexico’s Yucatan peninsula. While officially part of Mexico, it felt Spanglish, i.e. half Spanish, half English and more American than Miami. It’s a modern and beautiful destination as well as a Mecca for cruise ships because of its abundant shopping and beautiful extended beaches sitting next to lovely aquamarine Caribbean waters. I am convinced I could live here and never need to know a word of Spanish. Since its economy is virtually all funded from tourist traffic, virtually everyone involved in commerce must know English, or at least enough English to conduct business. Four cruise ships were in port when we docked. We found ourselves looking into cabins of Royal Caribbean’s Liberty of the Seas, a nearly identical sister ship to our Voyager of the Seas. 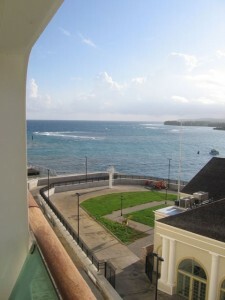 The cruise terminal in Cozumel came complete with many noisy vendors. We apparently arrived at the height of tourist season. 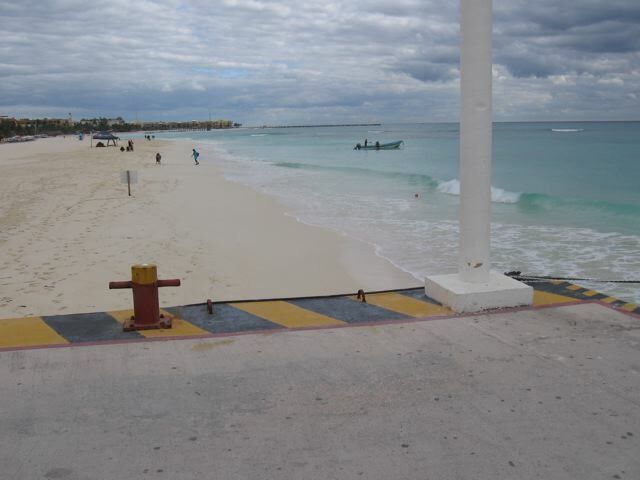 In fact, it was a brisk day with temperatures in the low seventies in Cozumel, so if you were on the beach you were likely walking on it with a towel draped over you for warmth. 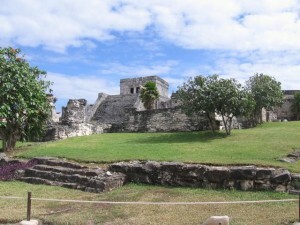 Several hundred of us opted for the tour of the Mayan Tulum Ruins on the Yucatan peninsula. We filled nearly to capacity a large chartered ferry that zipped us across choppy seas to the city of Playa de Carmen on the mainland, about ten miles away. How choppy a ride is it? The crew routinely hands out barf bag to queasy passengers, which fortunately I never needed. 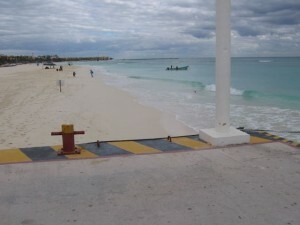 It is a relatively recent city that seemingly evolved to support the commerce on Cozumel. I knew from reports that Mexico is becoming increasingly violent as a result of drug commerce. At least here on the Yucatan no drug war is in evidence. We were soon on a chartered bus with an English-speaking tour guide heading south to the Tulum Ruins, traveling on a broad and well-marked expressway. Along the side of the road were many resorts, many with signs in English encouraging Americans to visit their resort or buy a home. Our tour guide happened to be Mayan by ancestry, and was fluent in Mayan as well as Spanish and English. This was useful for our tour, as it provided a depth to the experience that we might not have gotten otherwise. The Mayan ruins at Tulum are a huge tourist attraction, and arriving at the height of tourism season as we did also made for a crowded experience. Fortunately, the weather cooperated by providing blue skies and comfortable temperatures. Touring the ruins was definitely worth the hassle of the drive and choppy ferry rides. Much of the ruins have disappeared, but many remain including much of the grand temple framed against the backdrop of the Atlantic Ocean, are mostly intact, including the platform where many people (principally children) were sacrificed. Odd as it may seem, being chosen for sacrifice was considered a privilege as it supposedly moved you into a better life. Among the curious facts that I learned: the Mayans were short as a race, about four feet tall on average, due in part to nutritional deficiencies but also due to the fresh water containing too much calcium from being filtered through the abundant limestone rock. About 3500 B.C. the Mayans were the height of civilization in the western hemisphere and were by any standards an advanced civilization, having mastered math and the calendar. They were certainly on par with the learned Egyptians at that time. 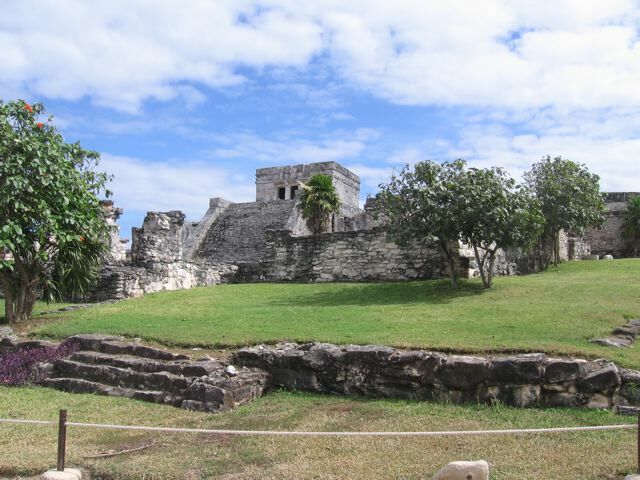 The site is definitely worth seeing if you are on the Yucatan peninsula and suggests a hemisphere with a far richer culture than is generally known or taught in our history books. It took the arrival of the Spaniards to kill the remnants of it and the Aztec civilizations. For me, Mexico was definitely the highlight of our cruise. I wish we had another day for additional tours and shopping, but by sunset we were pulling out of Cozumel and northbound back to our cruise port of New Orleans.